Having this blog to look back on is pretty neat – I get to revisit my younger self, see what I thought about stuff, and reflect on what’s changed. Most people can probably relate to how it feels when they discover an old essay they wrote for school, or a set of pictures from some big event in their life – a very human mix of nostalgia, slightly embarrassed introspection and my-god-where-has-the-time-gone reflection on changing priorities. Anyway, I was doing some house keeping and found this post. I think it is as useful now as it was then. Me in a younger mans clothes – a few days before I wrote this post. How’s the Sprint Veloce doing Corey? From July 30, 2008: Cleaning up the differential housing was one of those jobs I resisted doing for a while. Every time I looked at it the 2 hours of scraping, solvent bathing and degreaser scrubbing I would have to do flashed before my eyes and I found something else to do. Last week I rearranged a lot of my stuff to fit the Berlina in my space and found myself once again faced with this greasy lump in a tray sitting on my bench top waiting for me to clean it. It was time to face the subject of so much procrastination. The housing was covered in a thick coating of dirt that had bonded with oil and built up over the years. To save time and solvent I used a small scraper to remove the big stuff. By the time I was done I had removed probably three pounds of the caked oily dirt. Greasy oily goo scraped off easily, but there was so much of it that it took about an hour to get it ready for a solvent bath. It’s nice to have a couple of working examples hanging around the shop to supplement the parts book when it comes to finalizing assemblies. Even when taking care to label and organize parts as they come apart it’s possible to mix them up and if they have been apart before, which on a 47 year old car you have to assume they have, it’s possible they are not put together correctly in the first place. I started on the complete sinestro (left) front suspension assembly with the goal of having it completely ready to bolt on the car before I moved on to the destro assembly. All of the upper wishbone parts had been cleaned and painted before I started this blog so I will deal with the assembly now as a whole for simplicity and look at most of the individual parts later in the blog as I work on the destro unit. The first two pictures below are of the destro assembly to give an idea of the condition of the sinestro parts before I started work. Complete lower Destro Wishbone assembly ready for hours of attention. This should give an idea of how much work went into the Sinestro assembly. 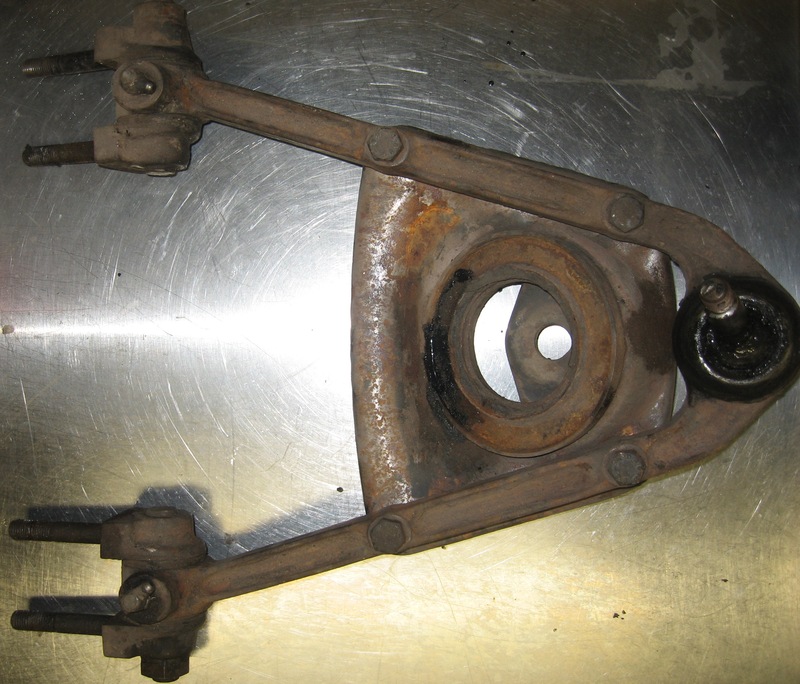 Rebound limit straps are very important, if the rear axle were allowed to rebound freely away from the body without them, due to a large bump, the single nut at the upper end of the shocks is the next limiting devise. This nut is small and the sheet metal it mounts the shock to is not thick so damage to this area is easily possible. The straps are a strip of layered canvas bonded with rubber which is clamped together by metal plates held together by nuts and bolts to form a loop. 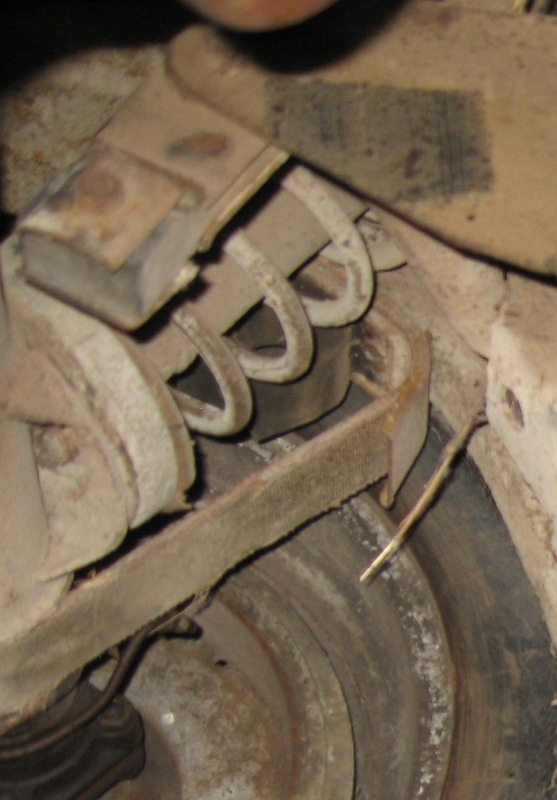 A rubber bump stop limits axle travel toward the body. Conveniently the strap and bump stop are incorporated into the same assembly. This strap, although frayed, is still in one piece and functional. The differential and axle assembly has to be able move around freely as the rear suspension absorbs bumps and loading changes caused during cornering and braking. This travel in the axle has to be limited so that the wheels can’t come into contact with the body in any loading condition. 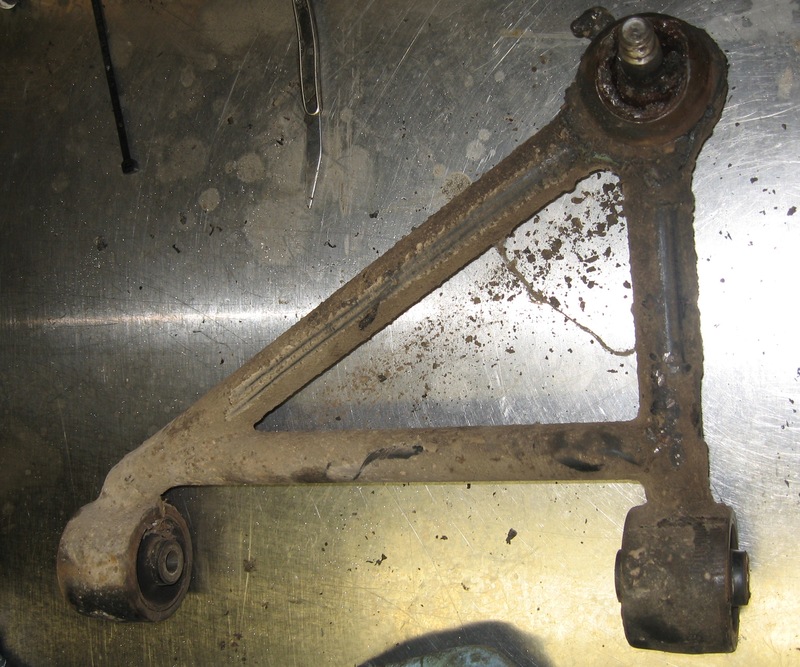 To accomplish this the axle assembly is attached to the body by a rear triangle at its center and a pair of trailing arms at either end. 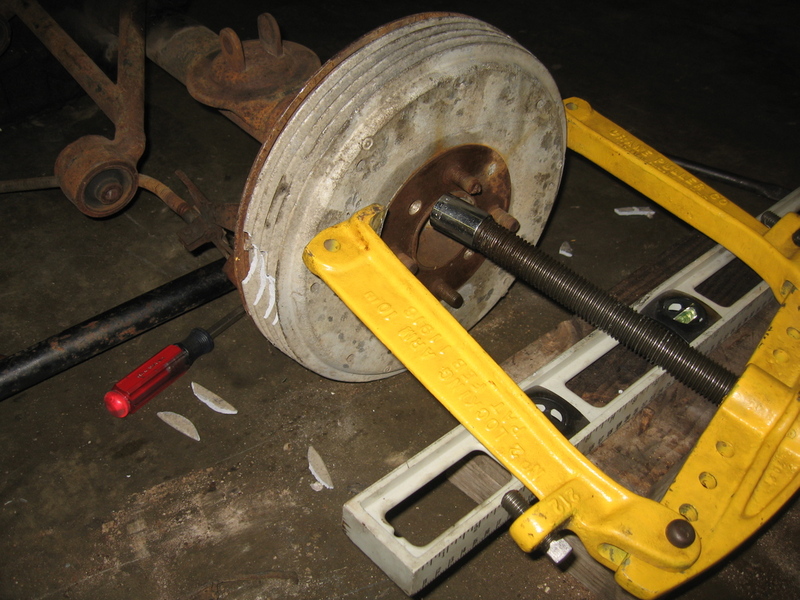 These pivot together as a sort of 3 dimensional four-bar linkage through the center of the massive ball joint that connects the triangle to a boss nearly equidistant from the two rear wheels on the axle. The ball joint is the fulcrum of a teeter-totter between the two rear wheels. With respect to each other and this point when one goes up, the other goes down. This motion is softened with respect to the body by springs that are dampened by shock absorbers and the travel at either end is limited by canvas straps. The entire assembly is isolated from the rest of the car by rubber bushings. 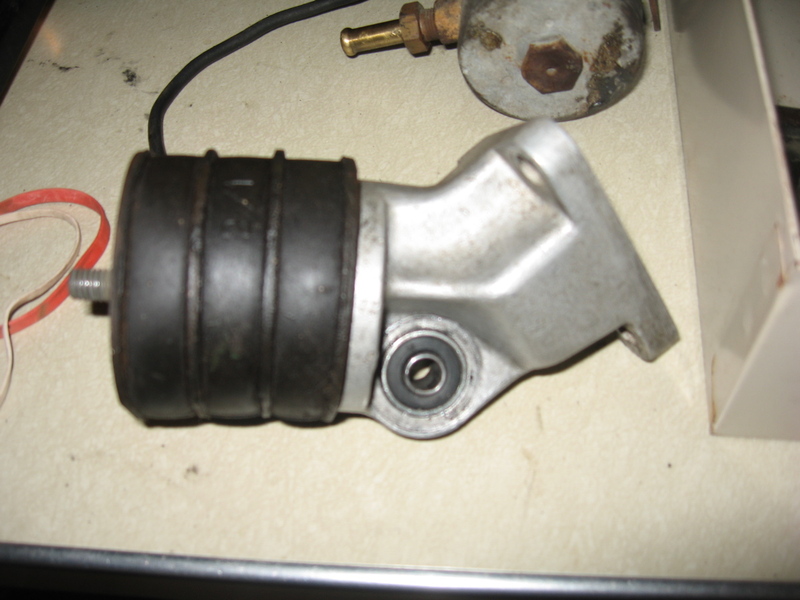 The ball joint pin is a taper fit into the boss it goes in on the axle housing. 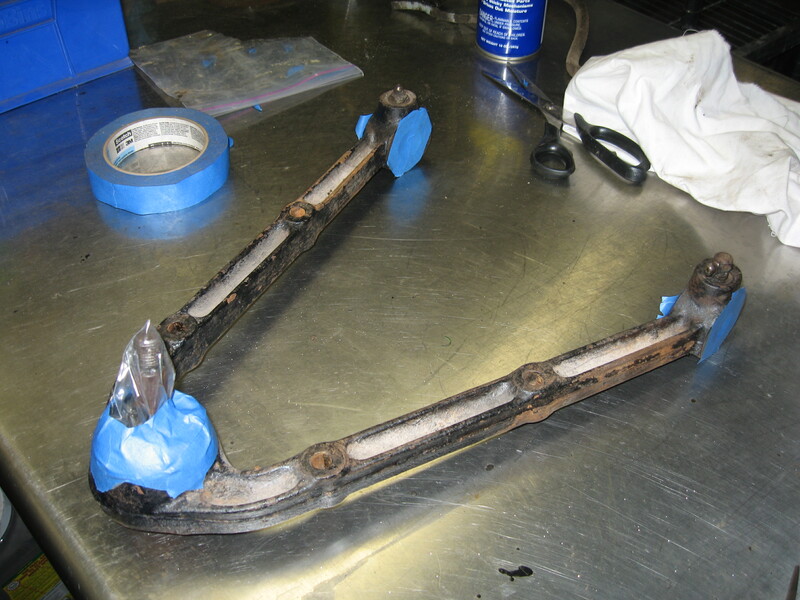 Removing the triangle from the rear axle required heat and a ball joint separating tool commonly called a pickle fork. The pickle fork works by acting as a wedge between the axle housing boss and the triangle. I first scraped as much grease as I could off the boss to avoid a fire and to minimize stinky fumes, then heated the boss up, once it was hot I used a big hammer on the end of the pickle fork and the ball joint popped out of the taper. A lot of road grime attaches itself to everything on the underside of the car and the axle locating triangle is no exception.